If you're a music box collector, you will surely want to add a vintage Japanese music box to your collection if you don't already have one. These beautiful, delicate, intricately decorated music boxes are not too hard to find online. Music boxes have been around for over 200 years. They are described as a type of automatic musical instrument that are able to produce sound by using a set of pins placed on a revolving cylinder or disk. 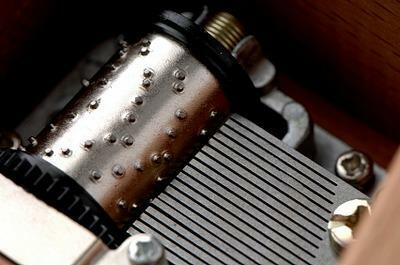 The pins strike the metal teeth of a steel comb and produce musical notes. Modern music boxes were developed from musical snuff boxes from the 18th-century, which were small enough to fit into a gentleman's waistcoat pocket. Early music boxes came in a variety of sizes, however most were able to fit on a tabletop. Most were built by artisan watchmakers, with a large number being produced in Switzerland. The first music box factory was opened there and by the end of the 19th century, European music box makers started to open factories in the United States. Sankyo Seiki is a Japanese music box company that started producing music boxes in the aftermath of World War II. Sankyo used the latest automation technology to mass produce affordable music boxes. Sankyo has grown to become the biggest manufacturer of music boxes in the world and supplies music box hardware to other manufacturers and distributors. Sankyo now sells licenses for its music box tunes to cellular phone companies for use as ring tones. Many of the vintage Japanese music boxes you will find today are made by Sankyo. You will find a wide variety of vintage Sankyo music boxes online. The most common type is a rectangular wood black lacquered music box. However, you can also find Sankyo music boxes that look like little figurines such as frogs, Santas, Christmas angles, Raggedy Ann, clowns, praying children and much, much more. A wonderful style of vintage music box that was made in Japan are the miniature piano music boxes. These quaint little wooden music boxes looked just like a grand piano. You can view two lovely examples of these vintage music boxes at Ruby Lane. Both boxes have the same gold decorative pattern painted on the top of the piano, which opens up. The keyboard covers also open and the boxes are lined on the inside with a red material that appears to be a coarse velvet. The main difference between the two boxes is that the larger one has a twirling ballerina dancing in front of a mirror. A common reoccurring theme with old Japanese made music boxes are Santa style music boxes. These are typically made of porcelain and play some type of Christmas music tune. If you want to find one in your local area, try estate sales, yard sales, goodwill stores, thrift shops or a local antique dealer. One advantage to collecting music boxes is that most are still very affordable as opposed to other types of antique collectibles such as stamps or baseball cards. Most antique music boxes cost under $100.